This uniquely designed nozzle releases fuel already mixed with air as a fine spray which fans out into the intake runner. For ease and quick tuning, you can change an internal jet instead of the entire nozzle. 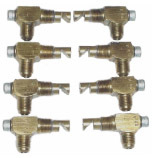 Nozzles for Crower injectors are available in various sizes for gas and alcohol. Our pills are flowed and kept to a strict tolerance.